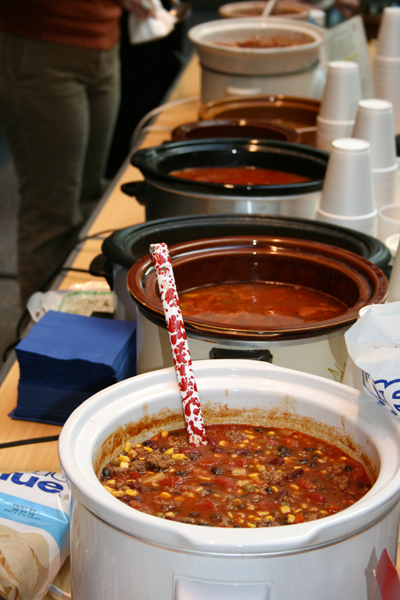 The work day is more fun when there’s chili involved. 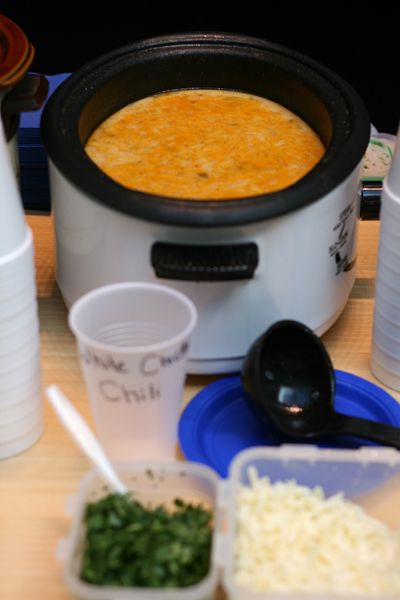 Yesterday my office organized a chili cook-off — perhaps not the best plan for a 75-degree spring day, but nevertheless. There was taco chili, vegetarian chili, green chili stew, five pepper chili, and chicken chipotle chili. There were at least three types of cornbread and brownies for dessert. I contributed a white chicken chili. The cumin and cilantro give this chili a nice deep flavor, and the cornmeal brings it to just the right consistency. Unfortunately, it placed second just behind the taco chili, but I still think it’s a winner! Place chicken in casserole dish with about 1 cup chicken broth. Cook for 15-20 minutes at 375°. In a dutch oven (or large stock pot) over medium-high heat, saute onions and garlic for 2 minutes. Add chopped green chilies and beans. Pour in chicken broth. Add sliced jalapenos. Season with salt, pepper, and cumin. Place lid on pot and reduce heat to low. Cook for 30 minutes. Add cooked and chopped chicken. Cook for additional 15 minutes. Mix milk with cornmeal and add to chili. Cook for another 10 minutes to thicken. Add cayenne pepper and paprika. Add some Monterey Jack cheese to the pot and stir to melt. I can say I really enjoyed your White Chicken Chili. It got my vote and I can not wait to make it at home! Thank you for bringing it! Tried this last night–was absolutely delicious! It’s definitely a keeper!